In 1997, the first pair of Sloggers shoes were made. 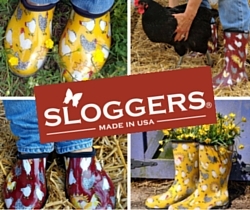 In the beginning, we sold Sloggers to distributors and wholesalers mainly in lawn and garden markets. As the demand for Sloggers and all-day waterproof footwear grew in areas outside of lawn and garden we realized we would have to create prints for these folks too..
Our core business remains lawn and garden. Our commitment to release new prints and collections in garden shoes each year is our top priority. As we grow, we will add new prints, collections and styles to our waterproof footwear line. We do this with lots of consideration and data from both our wholesalers and customers. It is a timely process to add styles to the line and schedule when new collections are made in consideration to fulfilling seasonal wholesale orders. With that being said this is what we are committed right now. 1. Adding new prints and collections to lawn and garden. 2. With the popularity of our Chicken Collection, we have also realized there is quite a demand for barn animals. We now plan to release one barnyard animal collection in coop boots and barn shoes each year. As demand grows, we will add more animals. 3. We have also been asked for more “daily-casual” styles with low contrasting patterns, this is something we are developing for 2017. As we grow and make decisions about expanding the line, we are most grateful for the support and feedback of our fans. When we share ideas and patterns we are working on via our Facebook page, your feedback has been tremendous. Thank you for helping us grow and thank you for your patience while we do.